Participant : UNIST President Mooyoung Jung, Professor Jaephil Cho of UNIST, President Gon-emon Kurihara of JEOL Ltd., President ChangSoon Kim and Otani Keiichi of JEOL Korea Ltd. 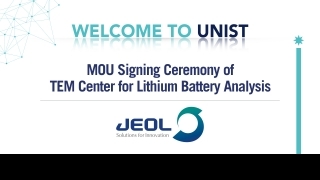 The signing ceremony of the Memorandum of Understanding for TEM Center for Lithium Battery Analysis between UNIST and JEOL Ltd. will be held in the main conference room of the UNIST Main Admin. building on February 9, 2017.